Petella cruises to meet-record US#4 4:18 win at sectionals!!!!! You can’t help but wonder: If Luke Petela is running 4:18 unchallenged on a flat track in January, just how fast is he going to run by the end of the winter? What about by the end of the spring? Petela continued his hot running Friday with a big meet-record 4:18.15 win in the 1,600-meter run at the South Jersey Group 1 meet at the Bubble in Toms River. It was the first time under 4:20 indoors for Petela, whose time is No. 1 in New Jersey this year and broke the meet record of 4:21.84 set two years ago by Pleasantville’s Jacob Clark. Petela’s time is also No. 4 nationally and less than two seconds out of first. It’s fastest by a Camden County miler in five years, since Ben Potts of Haddonfield ran 4:16.85 at the 2010 Meet of Champions. It’s also fourth-fastest ever at any of the indoor sectional meets, second-fastest ever at any of the South Jersey sectionals and fastest in four years. Petela’s previous indoor PR was a 4:25.05 from last year’s Meet of Champions, when he placed 21st after taking second at indoor states. Outdoors last spring, Petela ran 4:16.55 to win the Camden County title, 4:17.20 to win states and 4:14.39 for second at the Meet of Champs, just behind Kyle Levermore of Don Bosco, who won in 4:13.98. The South Jersey indoor record is Marc Pelerin’s 4:15.16 for a full mile by Marc Pelerin of Cherokee in 2002. The Camden County record is 4:14.0 full mile by Cherry Hill East’s Marty Ludwikowski in 1975. 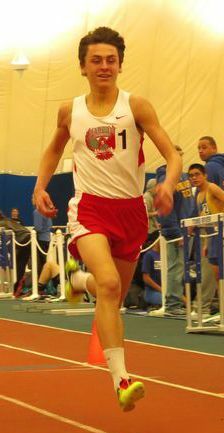 Petela led a 1-2 Haddon Township sweep in the 1,600, with junior Owen Long taking second in 4:28.22. Petela and Long also went 1-2 in outdoor sectionals in the 1,600 and in cross country sectionals at Delsea in November. 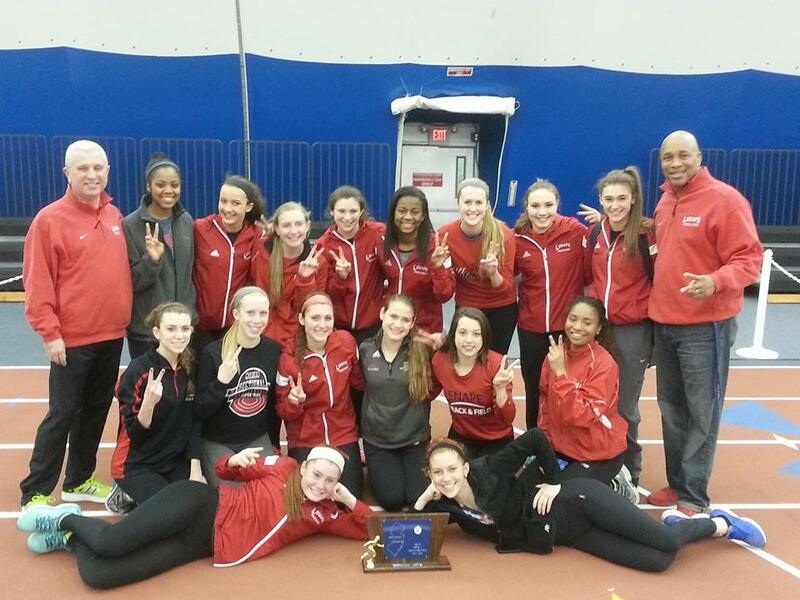 Middle-distance strength leads Lenape girls to repeat SJ-4 crown!!! Lenape knew it needed a mighty effort across the board to beat another terrific Southern Regional team at sectionals, and the Lenape girls got just that Saturday, riding a 1-2 finish in the 400 to a close win over their long-time rivals at the South Jersey Group 4 meet at the Bubble in Toms River. This Lenape-Southern rivalry has been going for a decade now, and indoor sectionals this year was no different than most Group 4 meets. It came down to the Indians from Medford and the Rams from Stafford Township. Lenape finished with a five-point win over Southern, 63-58, to win its second straight sectional title. Lenape beat Southern 60 1/2-49 1/2 at last year’s indoor sectionals. Southern got Lenape at sectionals outdoors, 67-57. How even are these programs? At the state relays, they tied with 28 points. Either Lenape or Southern has won indoor Group 4 sectionals six of eight years since the meet’s inception in 2008. On Saturday, Lenape scored 28 percent of its points in one event, with senior Carly Pettipaw and sophomore Jasmine Staten going 1-2 in the 400, both under 59 seconds. Pettipaw’s 58.51 and Staten’s 58.74 are No. 2 and 3 in South Jersey this year. Pettipaw and Staten came back to help Lenape win the 4-by-400 — over Southern — in 4:03.45. Shannon Storms and Marissa Topolski also ran on Lenape’s 4-by-4. The Indians got points all over the place but scored big points — 12 each — in the 1,600 and pole vault. Megan Quimby PR’d 5:05.79 for second in the 1,600, with Camille Franklin not far back in fourth. In the vault, Storms and Gabby Sharp went 2-4. Lenape also got six points in the 800 with Pettipaw and Quimby, four points from Staten, fourth in the dash and a couple points from high jumper Sabrina LaRosa. Rancocas Valley boys blast U.S. #9 sprint medley at New Balance! Rancocas Valley got its sprint medley nationals qualifier out of the way Saturday at the Armory, setting a school record of 3:35.86 in the process. RV’s time is No. 1 in South Jersey this year and No. 3 in New Jersey. It’s also No. 15 in South Jersey indoor history and the fastest by a Burlington County school since Rob Novak and Bordentown ran 3:34.96 in 2005. The Red Devils placed fifth in a hot race at the New Balance Invitational on the Armory’s banked 200-meter track. The race produced eight of the 18-fastest times in the U.S. this year, including the top three — 3:26.11 by Cheltenham, just outside Philadelphia; 3:27.40 by Boys and Girls of Brooklyn; and 3:31.74 by Clara Barton of Brooklyn. RV actually placed second in its section, just behind South Shore of New York, which ran 3:35.55. Isaiah Curbelo led off with a 49.7 for 400 meters, with JeSean Foster (23.2) and Sterling Pierce (22.5) setting up Jose Colon-Cruz, who anchored in 2:00.1. RV’s previous indoor school record was a 3:39.0 two years ago at the Lavino Relays in Lawrenceville. The Red Devils ran 3:30.68 last spring, which was No. 5 in New Jersey in 2014 and No. 2 in South Jersey. One other RV note from the Armory — Zakiyy Williams broke the Burlington County indoor triple jump record with a 44-5 in his first competition of the year. Williams broke the mark of 43-7 set at the 2013 Easterns by Lenape’s Jermane Owens. 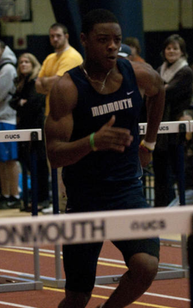 Jalen Walker is picking up right where he left off last winter with some hot hurdling for the Monmouth Hawks track team. Walker, a state champion in the 110 highs in 2010 running for Rick Craft at Burlington Township while attending Westampton Tech, won the 60-meter highs at the Lehigh Angry Birds Invitational at Rauch Fieldhouse in Bethlehem, Pa., over the weekend with a season-best 8.10. Walker led a 1-2-3-4 Monmouth sweep on the way to the team title. Walker actually owns the five-fastest times in Monmouth history – you can check out the entire Monmouth record book, which is loaded with South Jersey alums, here. Walker’s only loss so far this year was to teammate Geordan Ferguson at the Rutgers Invitational, where Ferguson ran 8.14 and Walker finished 2-100ths of a second back. Walker has already qualified for the IC4As and is the top hurdler in the MAAC. He’s already won conference titles both indoors and outdoors. This year’s MAAC championships are Feb. 21 at the 168th Street Armory in New York. Huge day for Booker family at state Relays!!!!! What a day for the legendary Booker family Sunday at the state relays! In the morning at the Bennett Center in Toms River, coach Martin Booker’s Willingboro Chimeras outscored Haddonfield 44-40 to win the state Group 1 team title. And then Booker’s son, Martin Booker Jr., anchored Pennsauken’s 800-meter relay with a fast 1:32.82. New Jersey track championships are nothing new for Booker. He was two-time state champ in the hurdles at Camden in the early 1980s before starring at Villanova. He won over a dozen indoor, outdoor and state relays championships while at Camden and has picked right up where he left off at Willingboro. The state relays title was the 14th all-time for Willingboro. In state relays history, which goes back to 1966, no public school has won more boys state relays titles. For a list of all-time state relays winners and records, click here. Willingboro picked up three wins, with Zavian Bell, Kenny Brosier, Tyler Davidson and David Miller winning the 800-meter relay in 1:34.03, the shuttle hurdles with Yunisa Bakarr, Bell, Brosier and Michael Walker running 31.19 — 1-100th of a second ahead of Palmyra, and the shot put relay, with seniors Yeisont Medina (46-10 1/2) and Isaiah Marshall (45-5 1/4). Then there was Booker Jr., only a sophomore at Pennsauken. Booker anchored Pennsauken’s winning 4-by-200 team, with juniors Marquan Jones and Ryan Wemegah and senior Brandon Harley. Booker also helped Pennsauken pick up a point in the 4-by-4, teaming up with Jones, Harley and Wemegah to take sixth in 3:35.12. 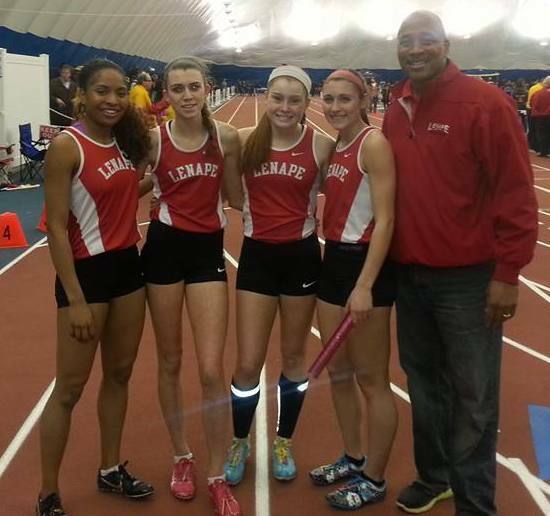 Record-setting sprint relay double for Lenape girls! Lenape’s record-setting sprint med team with coach Gerald Richardson. The names change, the years go by and one thing never changes: Lenape always has fast middle-distance teams. The Lenape girls put together a very fast relay double Thursday afternoon at the Bubble in Toms River, with the 1,600-meter relay team winning 4:01.68 and the sprint medley team 4:08.21. Both marks are No. 1 in New Jersey this year. Let’s start with Lenape’s sprint medley. The team of sophomores Jasmine Staten and Megan Quimby and seniors Samantha Maynes and Carly Pettipaw ran 4:08.21. Pettipaw led off in 59.5, followed by Staten (25.7) and Maynes (26.7) to set up Quimby, who anchored in 2:15.5. –> The time is No. 4 in the U.S. so far this year, behind only Rush-Henrietta of New York (4:04.72 at the Dartmouth Relays), Oak Park, Ich. (4:07.41 at the MITS meet at Eastern Michigan) and Kellenberg, N.Y. (4:07.89 at the Millrose Trials at the Armory). –> It’s also a state relays meet Group 4 and overall state relays meet record, breaking the marks of 4:08.84 set by Columbia last year. –> It’s No. 4 in South Jersey history, behind Willingboro’s 4:01.41 in 2003, Haddonfield’s 4:03.93 in 2003 and Washington Township’s 4:04.38 in 2010. –> It’s also No. 19 in state history and broke the indoor school record of 4:10.51 that Lenape ran in 2007. Lenape’s outdoor sprint medley school record is 4:03.54, set when the Indians placed seventh at New Balance Nationals, earning All-America honors for Dana Cataldo, Kahmil Johnson, Kendra Johnson and Erika Griffith. Then there was the 4:01.68 for the 1,600-meter relay, which isn’t quite as fast as the sprint medley but is still very fast for this early in the season. Sophomore Jasmine Staten, junior Shannon Storms, senior Marissa Topolski and senior Carly Pettipaw ran 4:01.68, with Staten leading off in 60.1, Storms coming through in 60.8, Topolski splitting 61.2 and Pettipaw anchoring in 58.5. Lenape’s time is No. 1 in New Jersey so far this year and No. 15 nationally. And while the Indians fell a few seconds shy of the meet record set last year by Columbia, they did post the No. 6 time in any group in meet history. Full results from the state Group 4 girls results can be found here. Devon Grisbaum on her way to a U.S. #2 10:09 at the Armory. 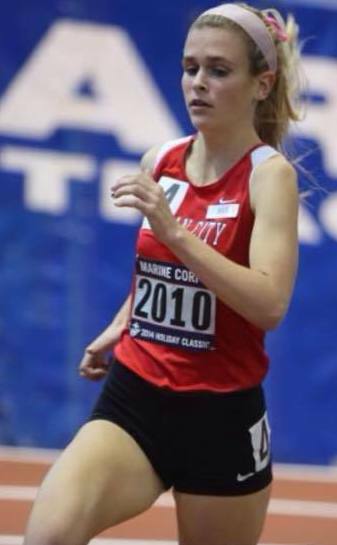 Devin Grisbaum of Ocean City opened up her indoor season the same way she finished her cross country season. Grisbaum, the XC Meet of Champions winner, won the 3,000 at the Hispanic Games over the weekend with a swift 10:09.80 over the banked 200-meter track at the 168th Street Armory. Grisbaum outran a loaded field that saw six girls run 10:20 or faster. Second was Aaliyah Wajid of Dewitt Clinton in Brooklyn, who ran 10:16.11. Her time is No. 2 in the U.S. this year, behind only the 10:08.44 run by Bella Burda of Arlington, N.Y., at the Rhode Island Classic in Providence on Dec. 27. The Hispanic Games 3,000 produced six of the top 19 times in the country so far this indoor season. Full results of the race are here: Results of the race are http://www.armorytrack.com/gprofile.php?mgroup_id=45586&do=news&news_id=307245#Womens_3k. Grisbaum’s time is No. 18 in state history and No. 2 in South Jersey history, behind only Megan Lacy’s 9:53.39 at the 2011 Princeton Invitational on Jadwin Gym’s flat 200-meter layout. So Grisbaum broke Sedberry’s school record by less than two seconds — or about 12/100ths of a second per lap. Grisbaum’s previous fastest 3,000 on record was a 10:30.42 last May at the Rowan Open in Glassboro, where she was third behind Lauren Zodl of Pinelands (10:14.45) and Ocean City teammate Mary Kate Brelsford (10:22.17).